Exclusion is convenient. Inclusion is inconvenient. Compromise is convenient. Sacrifice is inconvenient. Freedom is inconvenient. _ _ _ _ _ _ _ _ is convenient. There’s a singer I know – he’s been around the block. The chopping block and back. The US government once blacklisted this New Yorker. For 17 years, he was banned from TV. And this is after he once sung at the White House, as an honored American guest. His words have been sung by Artists as diverse as Massive Attack, Ani DiFranco, Bruce Springsteen, Olivia Newton-John, Dolly Parton, Chris Deburgh, Billy Bragg, Joan Baez, Peter, Paul and Mary, Earth, Wind & Fire, Indigo Girls, Jackson Browne, and Marlene Dietrich. This is a singer who practically single-handedly kick-started an American folk revival that featured Bob Dylan. Bill Clinton called him an “inconvenient” Artist. If you listen to his song collection…you would go WTF? How could they ban him? The songs, they seem kind of jolly, redemptive and hopeful. They’re in fact sometimes a little too happy. “Anytime you have an administration that punishes its enemies—that’s never as far away as you think it is,” Bruce Springsteen opined on PBS. True that, just ask Dixie Chicks. 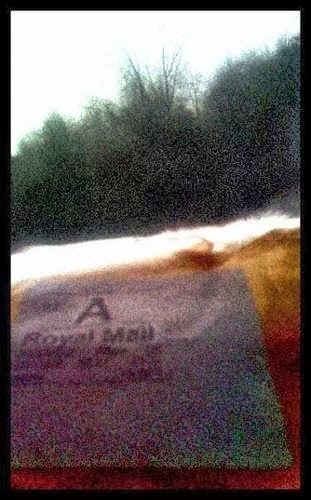 I thought of Pete Seeger when something strange happened in New York. I don’t have a lot of albums in my car. Maybe ten. I went to New York to see singer Andrea Ramolo. She randomly told me she had regretted leaving this man’s songs at home in Canada. And just my luck – or the luck of the Irish – or the luck of this 90 year-old singer (who is still alive and kicking playing Carnegie Hall) – I had this album among my ten. Bruce Springsteen paid tribute to him in We Shall Overcome: The Seeger Sessions. And I only had this album because an Irish friend insisted I have it (it was once hers), and she mailed it all the way from Ireland. I gave it to Andrea. So now this one album has been to three countries owned by three music fans. Pete Seeger – have will, will travel. We all share this love of Mary. Aretha Franklin sang it on Amazing Grace. Another version inspired Paul Simon to write Bridge Over Troubled Waters. 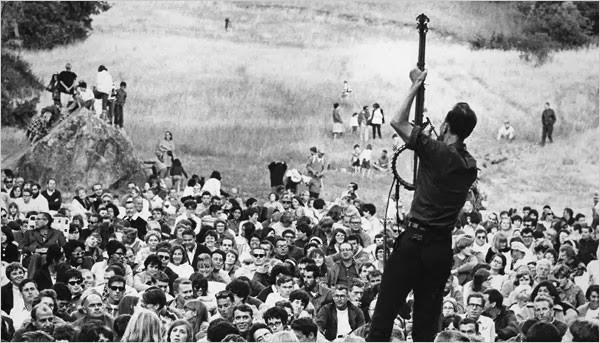 In some twist of history, Pete Seeger in a twisted American cultural revolution was banned from sharing his music to a national American audience. This is someone who knew more about American folk music history than nearly every American. Pete’s father was a pioneering ethno-musicologist. His mother, a violin teacher. His step mother, one of the 20th Century’s most notable female composers. Pete himself worked for Al Lomax at the Archive of American Folk Songs at the Library of Congress. His job was to curate songs that represent American Folk. A Harvard scholarship student drop-out (now that’s a rare thing to say), Peter Seeger started with the Vagabond Puppeteers. Like Jack Kerouac On The Road, Pete Seeger saw a lot of America. “During the entire trip the group never ate once in a restaurant. They slept out at night under the stars and cooked their own meals in the open, very often they were the guests of farmers. At rural affairs and union meetings, the farm women would bring `suppers’ and would vie with each other to see who could feed the troupe most, and after the affair the farmers would have earnest discussions about who would have the honor of taking them home for the night. During his Lomax days, Pete sang alongside Woody Guthrie (Bob Dylan’s hero) and Lead Belly. In 1941, Eleanor Roosevelt invited this rare racially integrated troupe to sing for soldiers at the White House. Lead Belly was known for his 12-string guitar. 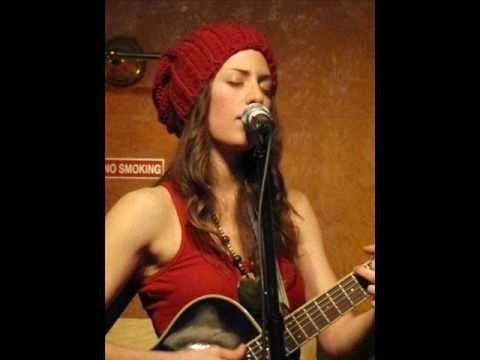 Andrea Ramolo sings Lead Belly’s In The Pines. Pete Seeger’s 1950 recording of Lead Belly's Goodnight Irene stayed #1 for 13 weeks in America. 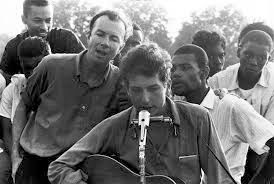 Then one dark day in 1953, Pete Seeger (along with his singing group The Weavers) was black-listed by the American government for not declaring his political beliefs…in the land of the free. Like the aftermath of the Dixie Chicks criticizing George Bush after 9/11…radio stations refused to play Pete Seeger records. Gigs were cancelled. All of them. In 1955, a promoter taking a chance rented New York’s Carnegie Hall. It sold out rapidly. Pete Seeger introduced Kumbaya – a Gulla song from slavery days – which in 1959 became a staple campfire song for girl and boy scouts. In 1948, Pete Seeger had already written the classic How to Play the Five-String Banjo, which started a banjo movement in America. Seeger invented the long-neck or Seeger Banjo. And a new sound. Pete Seeger’s We Shall Overcome inspired MLK and became the anthem of the Civil Rights Movement. Seeger was still banned from TV during the Kennedy years. Other people sang on television for him. Marlene Dietrich recorded his song Where Have All The Flowers Gone in English, German and French in 1962. Peter, Paul and Mary recorded his song If I Had A Hammer and of course there was Turn Turn Turn! 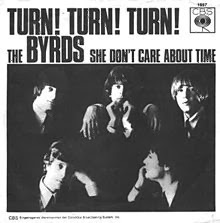 re-recorded by the Byrds…my favourite. If you ever see any footage of Pete Seeger…you will notice one thing…the images look like We Are the World. There were people of all kinds on his stage. I’d like to say these images look timeless…but today, they still look unique. The 1960 San Diego school board demanded Pete Seeger sign an oath that he would not overthrow the government. Otherwise, they threatened to shut down his concert. Pete refused and a court order enabled the show to go on. San Diego apologized 39 years later in 2009. On September 29, 2008, once banned from TV, Seeger at 89 made a rare national television appearance on the Late Show with David Letterman. He sung, "Don't say it can't be done, the battle's just begun...take it from Dr. King you too can learn to sing so drop the gun." 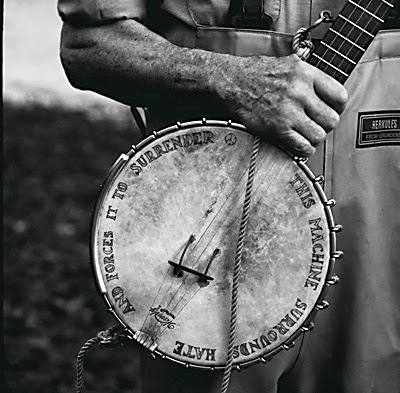 Inspired by Woody Guthrie, whose guitar was labeled "This machine kills fascists," Seeger's banjo motto. Earlier that month, the 52nd Monterey Jazz Festival, which never features folk music, invited Pete Seeger to headline. 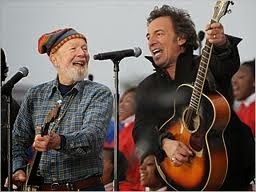 In 2009, Pete Seeger appeared with Bruce Springsteen for President Obama’s inauguration singing Woody Guthrie’s This Land Is Your Land. He closed the show. Two verses were included (not often included) about ignoring a Private Property sign and a reference to a Depression-era relief office. For those who know the song…those words really stuck out like thorns on a cactus. Pete Seeger brought Open Mics (aka Hootenannys) to New York City. He fought for openess and free speech. He was the mould for music in the modern era. “He was one of the few people who invoked the First Amendment in front of the House Un-American Activities Committee (HUAC). Everyone else had said the Fifth Amendment, the right against self-incrimination, and then they were dismissed. What Pete did, and what some other very powerful people who had the guts and the intestinal fortitude to stand up to the committee and say, "I'm gonna invoke the First Amendment, the right of freedom of association...."
...I was actually in law school when I read the case of Seeger v. United States, and it really changed my life, because I saw the courage of what he had done and what some other people had done by invoking the First Amendment, saying, "We're all Americans. We can associate with whoever we want to, and it doesn't matter who we associate with." That's what the founding fathers set up democracy to be. So I just really feel it's an important part of history that people need to remember." Pete later started a movement that cleaned up the Hudson River – long before environmentalism became popular. He married Toshi-Aline Ōta in 1943 and they’ve been together ever since. They bought land in the hamlet of Dutchess Junction in the Town of Fishkill, New York, at first living in a trailer in 1949. They then built a log cabin and house where they still live today. His 90th birthday in May, 2009, was celebrated at a full Madison Square Gardens. Dave Matthews, Bruce Springsteen, Tom Morello, and Joan Baez were among featured artists paying tribute. Few singers have had it harder, longer, more impactful and fulfilling than Pete Seeger in my life. Tonight I saw Pete Seeger: The Power Of Song on television. It’s strange to see the only singer banned from television for 17 years, only singer blacklisted in a Cold War. It was as if he never existed during that time.